There’s nothing worse than losing much-needed sleep time because of excessive noise levels entering the room from outside the home. Soundproof curtains are made from thick, densely layered material that absorbs and deflects sounds so you can stay asleep for longer. Whether you work nights and need to improve your quality of sleep during the noisy daytime, or if you live near a busy road and just want to reduce the noise levels entering the home, we think sound-proofing curtains can help. Explore our sound-proof curtain buying guide and get the sleep and quiet you deserve! We’ve also got some other great tips on how to soundproof other parts of your room and home. With more colours in the product range, the more likely you are to find a soundproof curtain that matches your home’s furnishings and decor. 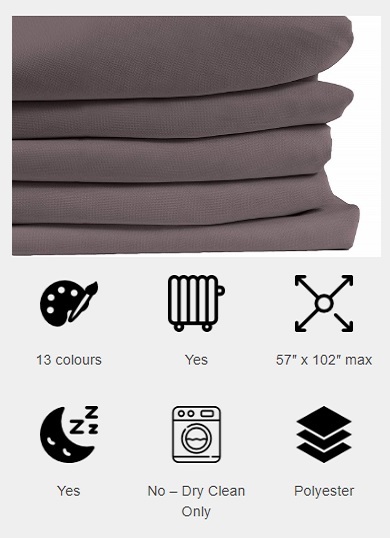 Keep an eye out for the colour pallette icon and the number of available colours in the range. In addition to soundproofing and blackout properties, look out for this symbol which means the curtain also keeps the warmth inside the home by thermally insulating the window. Sound-proof curtains are often much heavier and bulkier than standard curtains. Look out for this icon which tells you the manufacturer’s maximum width and height of the product. If you’re considering sound-proof curtains because you need to sleep better during the daytime, keep an eye out for this icon which means the curtains will also block out light. Some sound-proofing curtains will be machine washable while others may be dry clean only. Watch out for this icon which informs you of which cleaning method must be used. Curtains are made from a variety of materials, velvet, cotton and polyester are the most popular materials. This icon tells you which material the curtain is made from. Polyester is the best. The team here at Gifted Geek has been busy researching the best soundproofing curtains available to buy in 2018. Below you’ll find our top five curtains. All of our reviews are honest and independent. The Ridphonic soundproof curtain was by far the most effective noise blocking curtain we tested and looking closely at the design of the curtain, it’s easy to see why. This curtain has four layers of polyester and cotton and is 10mm thick, this includes 8mm of soundproofing materials. This is by far the thickest of the curtains we looked at. The manufacturer claims a reduction in noise penetration of 15db is achievable and we think their claims aren’t too far off what we experienced. 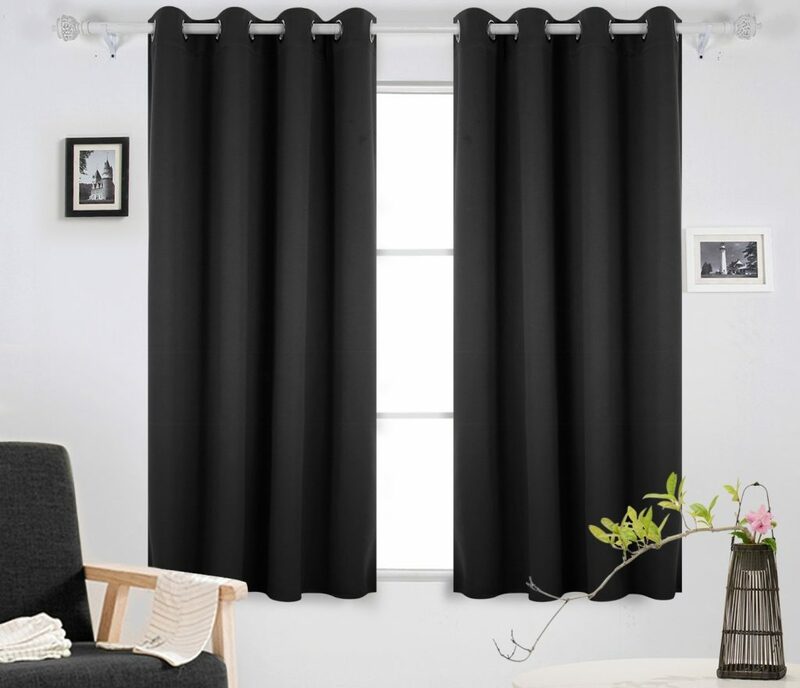 At nearly £150 for just one curtain (not a pair) this is also one of the most expensive products we looked at but you get what you pay for and this curtain weighs in at 6kg which would make a two curtain setup 12kg. Colours and size options are also limited. You may need to upgrade your curtain pole/rail to accept this weight too. Moondream curtains come in 13 different colours and several different sizes, up to an impressive 57″ x 102″. 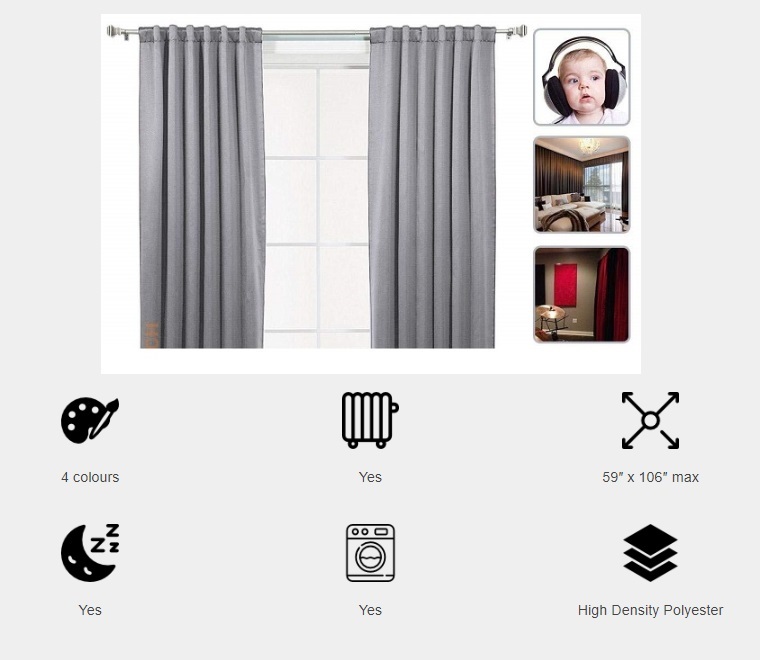 The manufacturer claims the curtain will absorb up to 7db of external noise which we feel is achievable given the curtains weight which is around 3kg per curtain. 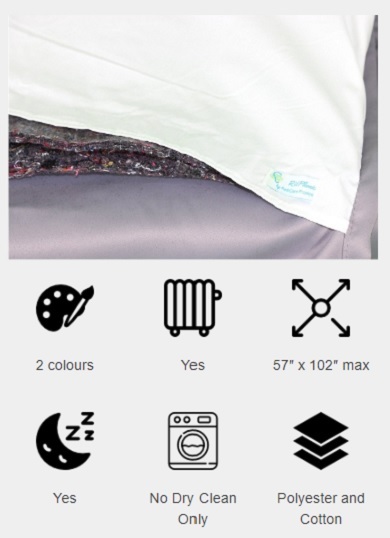 As with most other tick soundproofing curtains, the Moondream is dry clean only and is made mostly from polyester which is a good sound blocking material. This curtain also has impressive thermal and light blocking properties. With 13 colours to choose from, this curtain offers more choices than the Ridphonic, even if it doesn’t quite match it’s abilities to block sound. The price of this curtain is still quite high, currently just over £100 for a single curtain (not a pair) but most rails and poles should be able to cope with the weight without any reinforcements. Absolute Zero curtains are primarily blackout curtains that also have sound blocking and reducing qualities. We particularly liked the velvet look and feel to these curtains, which made the room feel like a home theatre. Weighing in at just under 1kg per curtain and less than 1cm in thickness, we didn’t have high expectations that this curtain would reduce the noise or even light entering the room. We were pleasantly surprised at the amount of the light that was blocked and for the price, also the noise reduction. This curtain can’t really be compared to the Ridphonic which made to the #1 spot on our list as that curtain is a dedicated sound blocker and is so thick; a whopping 9cm thicker than this curtain. We liked the price of this curtain, when we checked they were retailing for around £70 each and were machine washable which meant cleaning would be easier and cheaper. This curtain is a good all-rounder, blocks most light, some sound and is affordable. The Acepunch sound and light blocking curtain is manufactured from high-density polyester, which is our preferred material for absorbing sound. The manufacturer claims it has a high NRC rating (noise reduction coefficient). The triple-layered material is also very good at blocking light with many good reviews and customer photos available to see on Amazon. This curtain is only sold in four colours and a limited number of sizes but is machine washable. While nowhere near as effective at sound blocking as our #1 product, the Ridphonic, this curtain is far more reasonably priced at close to £50 per single curtain, that’s about a third of the cost of our top product. The Chadmade Soundproof curtain is another expensive product that performed well at blocking noise from entering the room via the window. 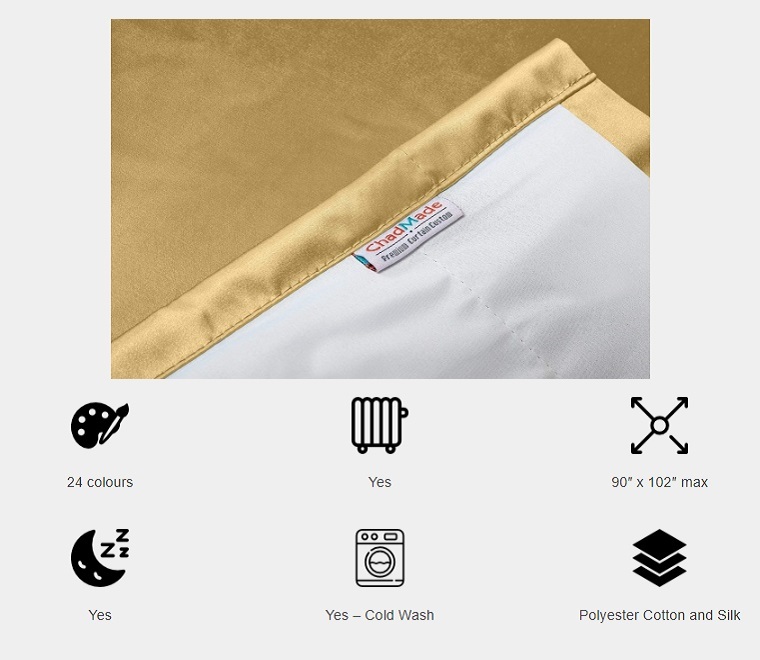 Weighing in at just over 5kg per curtain, this dense product contains 300GSM of sound and light blocking materials, including cotton and polyester. What really made this soundproof curtain stand out from the rest was the wide choice of colours and sizes. You can also order a custom sized curtain if you need to. 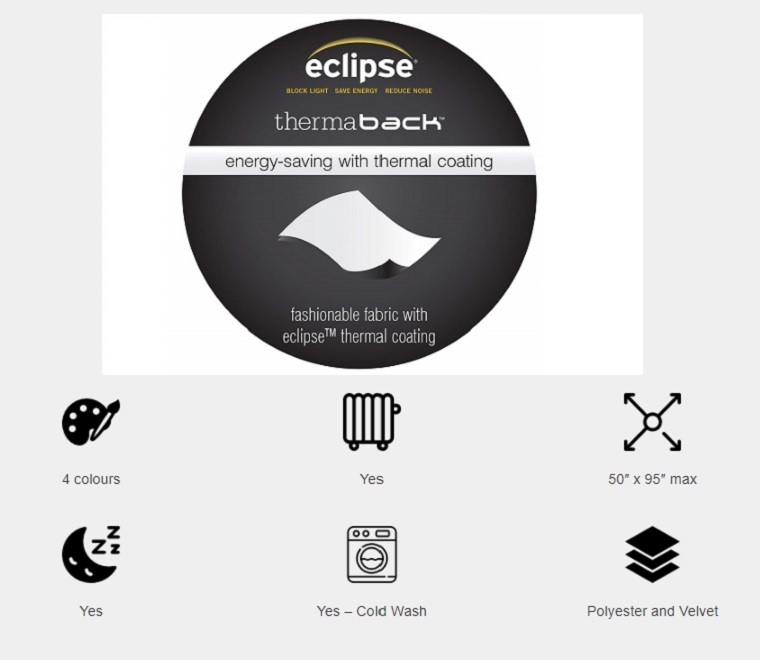 The product can be machine washed in cold water or dry cleaned. As with all the curtains we looked at, prices are per curtain not per pair. On the downside, this curtain currently retails at well over £100 per curtain and you may need to upgrade the rail/pole to hold the extra weight. Soundproof curtains are an easy, quick and relatively cheap way to reduce the sound that not only enters a room but also sound that rebounds off the surfaces within the room. They do have their limitations though and tend to work best in conjunction with other products and methods. Cavity wall insulation is an effective and cheap way to reduce the amount of sound that passes through the wall. Energy companies also offer discounts to help reduce the cost further. Double and triple glazing is perhaps one of the best ways to stop sound from passing through a window. coupled with a thick, dense and soundproof curtain, you can reduce the noise penetration by many decibels. Loft insulation helps to stop the noise that has entered the loft and travels down through the ceiling. Adding an extra 150mm of loft insulation can significantly reduce noise penetration. Professional soundproofing firms can install soundproof plasterboard and other noise reducing materials to walls that are allowing too much noise through. This page contains a guide to soundproofing costs and is an informative read. Don’t forget; a cheaper option for those struggling to get to sleep is to try one of these soft earplugs.